Leon Battista Alberti was a notable Italian architect and humanist, best known as the pioneer instigator of the Renaissance art theory. His intellect, personality and influential treatises have led to establish him as the prototype of the Renaissance “Universal man”. Leon Battista Alberti was born on February 14, 1404 in Genoa, Italy, as the illegitimate son of Lorenzo Alberti, a renowned merchant, and a Bolognese widow. Leon was acknowledged as a legitimate heir, and his father raised him and his brother in Venice. Belonging from an affluent and prosperous family of merchant-bankers, Leon enjoyed excellent academic opportunities and his father took particular interest in his education, ensuring he was well versed and efficient in mathematics, business and humanities. Upon reaching the age of 10, Leon was admitted to a boarding school in Padua where he received classical Latin training and upon completing his education at the school, Leon became an expert on Latin and a gifted literary stylist. At the age of 20, Leon began exhibiting his prowess as a classicist and he wrote a Latin comedy that became a huge success, and was praised as the “discovered” work of a Roman playwright. In 1588, it was published as a Roman work by the popular Venetian press of Aldus Manutius. Leon was greatly influenced by the ancient Roman history and literature, and he began deriving his ideologies on the basis of the urbane, secular and rational perspectives that he discovered in his study of ancient Rome. Alberti received his legal degree at the University of Bologna, even though he was not even mildly interested in pursuing a legal career, he went on to pursue his Ph.D. in law, and in 1428, he received his doctorate in canon law. Shortly after, instead of pursuing a legal career, he accepted a literary position as a secretary. In 1428, he was appointed a secretary in the Papal Chancery, Rome, and he was commissioned by an influential clerical patron to recompose a biography on the lives of the saints and martyrs in classical Latin. Following that, Alberti was commissioned to compose several works, and soon, the church became his source of income. Alberti took his holy orders, he was then allotted an allowance as a papal secretary, in addition to being a clerical parsonage, Alberti was also placed at the monastery of Gangalandi, Florence. Some years later, Nicholas V appointed him as the rector of Borgo San Lorenzo in Mugello. Despite his reputation as a devout and chaste churchman, Alberti was increasingly secular in his beliefs and practices, and he began composing a series of effective and influential writings addressing the broad topic of humanities. In 1432, he began composing his most influential treatise, “Della Famiglia” or “On the Family”, where he dealt with the day-to day concerns of a bourgeois family, discussing a wide range of topics including friendship, family, education, prosperity, husbandry and moral obligations among others. Albertis’ collaborations with the famous sculptor Donatello and renowned architect Brunelleschi pave the way for his most striking and influential development, the formulation of the systematization of the painter’s perspective. In 1435, he published “On Painting”, which marks the first publication regarding the rules of drawing a picture of a three-dimensional scene on a two-dimensional plan, this book had a remarkable influence on the Italian painting and the development of the Renaissance style. In 1438, while visiting the Este court in Ferrera, the Marchese Leonello commissioned to indulge his talents in the field of architecture, and Alberti began developing a miniature triumphal arch that supports an equestrian statue of Leonello’s father. Alberti soon began conducting extensive study in the fields of architecture and engineering, and upon his return to Rome in 1447, he was appointed the Pope’s architectural adviser. Alberti was commissioned by Pope Nicholas V to work on a series of remarkable Renaissance projects, including the reconstruction of the St. Peter’s and the Vatican Palace. In 1452, he published his extensive study of the works of Vitruvius as a monumental theoretical treatise, “De re aedificatoria” (Ten Books on Architecture), that won him the title of the “Florentine Vitruvius”. For the next 20 years, Alberti was commissioned on several iconic and remarkable projects including the Sta. Maria Novella and the Palazzo Rucellai, both in Florence, the Tempio Malatestiano, and the Church of San Andrea, all are profound and prominent depictions of the High Renaissance Style, making Alberti not only a renowned theorist of Renaissance Architecture, but also establishing him as one of its great practitioners. Alberti’s final and last treatise that came to acknowledged as his most influential and insightful work, “De iciarchia” (On the Man of Excellence and Ruler of His Family) was finished just a few years before his death. 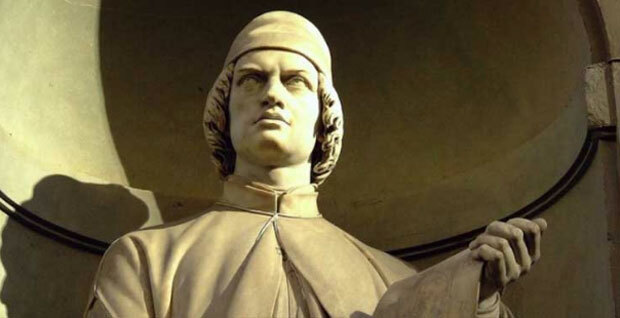 Leon Battista Alberti died on April 25, 1472, in the city of Rome.